Tiltan Systems Engineering is a leading provider of mapping and visualization solutions for 3D visual simulation and training applications. With more than 20 years of visualization experience, Tiltan solutions are used daily by organizations in the defense, homeland security, power distribution and energy industries. Tiltan clients include US, European, and Asian armies, governments and defense contractors; the IDF (Israel Defense Forces) air force, navy and army; Australian electricity networks and more. Tiltan stands out in its ability to deliver complete, end-to-end visualization solutions – all the way from automatic geo-mapping of terrains, through 3D photorealistic image generation, to comprehensive training systems for instructors and trainees. This A-to-Z offering approach ensures that the company covers all customers' needs, eliminating the need to struggle with supplying complex mapping data, as is required by most visualization vendors. From the technological standpoint, Tiltan excels at handling complex visualization systems, which require the coverage of large, highly-detailed geographical areas. 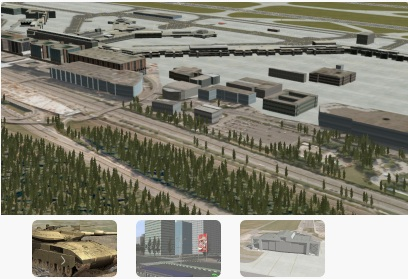 Tiltan powerful 3D Image generator supports the rendering of large terrains, such as dense urban areas, while providing the most accurate, detailed and close-to-life visualization. Tiltan was among the first to introduce HD capabilities into visualization solutions and its dynamic IR sensor, developed in-house, provides unmatched simulated realism. Tiltan is dedicated to ensuring customer satisfaction through built-in software flexibility and a high degree of customer responsiveness – to ensure that customers visualization solution always meets their exact requirements. Founded in 1991, Tiltan is headquartered in Israel with offices in New Jersey. Tiltan is backed by leading Israeli companies, including the Israeli Aerospace Industries (IAI) and Matrix IT. Tiltan partners with leading integrators, extending its reach and providing maximum value to customers. Tiltan highly experienced management team has extensive simulation, training and software development expertise, with field-proven experience in military operational training and integrating advanced technological systems into military and civilian organizations. TView is a powerful 3D image generator that enables real-time, photorealistic rendering of real world environments. Suitable for any other visual simulation application that requires detailed, high-end environment presentation, TView generates 3D photorealistic, sensor-based visual scenes of real-world locations with greater realism than any other solution available on the market. Running on commercial, off-the-shelf (COTS) PCs, and available as a runtime software solution or as an SDK, TView allows a rapid and cost-effective generation of visual databases for high-quality 3D simulation applications. Support for Any Terrain, Any Size. TView's powerful rendering engine can handle large physical environments requiring large, high-resolution databases. TView enables rendering of dense urban areas with geo-specific buildings and large numbers of moving objects as well as other environments such as jungles, deserts or oceans. Highly Realistic Sensor Presentation. TView's highly accurate, physics-based sensor simulation accurately renders the geospatial environment, material physics and operational effects – generating visuals and actions as close to life as possible. A dynamic Infrared (IR) sensor takes into account multiple parameters (such as material type, topographic information, sun position, time of operation, explosion and fire effects, meteorological data and more) to render a lifelike simulation of objects, with changes based on environmental conditions. Finely-Tuned Atmospheric Conditions. TView allows the generation of a wide range of atmospheric settings with granulated control over the exact conditions. This includes wind, haze and fog (set in logarithmic scale), clouds (3D volumetric and self-shaded), precipitation (rain, hail and snow), thunderstorms, sun (with full position control), moon (with 15-minute intervals), stars and horizon. Any Effect. Any Animation. TView supports hundreds of moving objects, including aircraft, missiles, ground vehicles, humans and animals. DRI (detection, recognition and identification) for objects at long ranges is enhanced through a textured billboard, enabling accurate representation even when object geometry is too small to see. Realistic human animation is enabled through motion-capture support and secondary animations. Maximum Flexibility. TView is highly customizable, so users can easily tailor their visual solution to fit their needs – today and tomorrow. Users can leverage their existing visual data with TView's support of multiple databases (Tiltan, CDB, OpenFlight). Easily add or modify sensors without any code modifications using an advanced sensor calibration tool. Tiltan's United Views software development kit (SDK) allows developers to design, implement and test a comprehensive visual presentation layer for advanced C4ISR systems. Developers can efficiently combine multiple visual data sources such as 3D geo-spatial data, 2D maps, video feeds and vector symbols and present them in a unified, coherent view to end users. 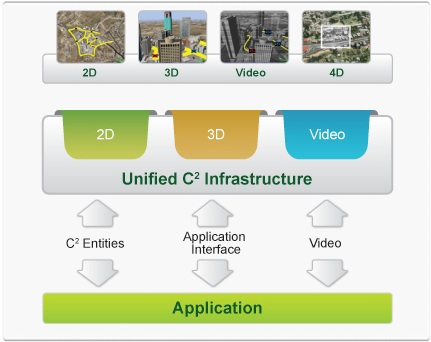 United Views consists of a comprehensive development environment that includes a core 3D rendering engine a 2D presentation viewing engine and a set of C++ modules, which together provide developers with all necessary building blocks for rapid implementation. Tiltan's Database Generation Suite (DBGS) enables users to build a visual database for a wide variety of applications such as simulators, command & control systems, and gaming. The DBGS also allows users of a Tiltan mapping and visualization systems to modify and enhance their visual databases independently and effectively. The Tiltan Database Generation Suite consists of a comprehensive set of tools accompanied by proven methodology and training. Together, these allow users to independently build and maintain rich visual databases from scratch, using a large variety of raw visual material, such as imagery, elevation data, vector data, 3D models and 3rd party databases. The DBGS includes automatic and rule-based construction features, which accelerate building the database. Based on an accumulated experience of several decades, Tiltan's DBGS provides a comprehensive infrastructure that enables rendering detailed views of real world environments with greater realism than any other solution available on the market. SkyKnight is a comprehensive PC-based simulation and training system for Unmanned Aerial Vehicles (UAV). Bringing together over 20 years of military simulation and visualization experience, SkyKnight provides the most efficient and realistic training for payload and aerial system operators. Unmatched Photorealistic UAV Simulation. Combining multiple technologies and proprietary algorithms, SkyKnight delivers the most realistic sensor simulation on the market. This includes highly accurate geospatial terrain representations, physics-based sensor simulation, atmospheric effects, thermal imaging and dynamic light, shadows, and terrain. 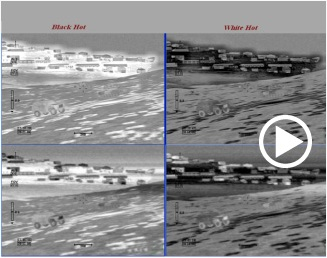 The result of these superior visualization capabilities is a positive training environment that maximizes operator readiness by dynamically simulating real conditions in combat scenes. For example, SkyKnight does all the following, and more: simulates visibility challenges due to atmospheric conditions (fog, haze, clouds, thunderstorms); dynamically modifies conditions to reflect day/night changes and shadow and sun positions. Comprehensive Sensor Support. SkyKnight lets users select one of the supplied suite of sensors during setup and then adjusts its views to the type of sensor they select. If needed, SkyKnight can be enhanced to support specific sensor/payload. Any Geographical Environment. SkyKnight is supplied with built-in urban and rural geographical options. These geographical databases can be replaced or customized with another environment based on users’ specific needs. Tiltan's TView Image Generation engine supports the rapid generation of photorealistic visual and sensor scenes of real-world locations in virtually unlimited size. Complete Training Solution. A multi-profile environment enables the integrated training of multiple users, including instructor, mission commander and operator. Instructors can conduct real-time monitoring, modify mission scenarios during training, provide feedback and perform after action review (AAR). Stand Alone or Embedded in GCS. In addition to functioning as a stand-alone training environment, SkyKnight can be embedded within Ground Control Stations (GCS). This enables training operators to operate as they would on a mission, using their actual controls and displays, yet using the video simulation data.